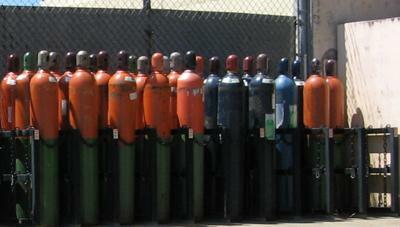 Cylinders - Hydrogen cylinders should be stored outside at a safe distance from structures, ventilation intakes, and vehicle routes, even while in use. Best practices call for compressed hydrogen bottles supplying a manifold to be located outside, with brazed/welded lines to connect to indoor equipment. 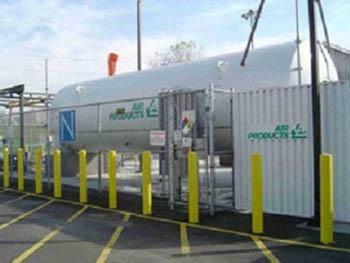 Vessels - Storage vessels for compressed hydrogen gas should be designed, constructed, tested, and maintained in accordance with applicable codes and standards. Liquid hydrogen is usually stored in horizontal or vertical cylindrical tanks. Spherical tanks are sometimes used for larger volumes. Tanks are vacuum-insulated and contain redundant pressure-relief devices as a safety precaution to prevent over pressurization.